Here is an easy vegetable soup recipe that follows the second method of preparing the soup. Place a medium sized frying pan on medium to high heat and melt half the butter. Add the finely chopped onions and fry until the onions become translucent. Add vegetables and stir-fry for 2 minutes. Transfer to a large bowl and pour in the vegetable stock. Place in the pressure cooker and cook for 3 whistles on medium to high flame. Lower the flame and simmer for 20 minutes. If you want a clear soup, strain and adjust the seasoning. In a small frying pan placed on medium to high heat, sauté onions until dark brown. Spoon in the soup into soup bowls. Top with browned onions and serve hot. If you want a creamy soup, follow the steps mentioned below. Take out the vegetables from the pressure cooker and allow to cool. 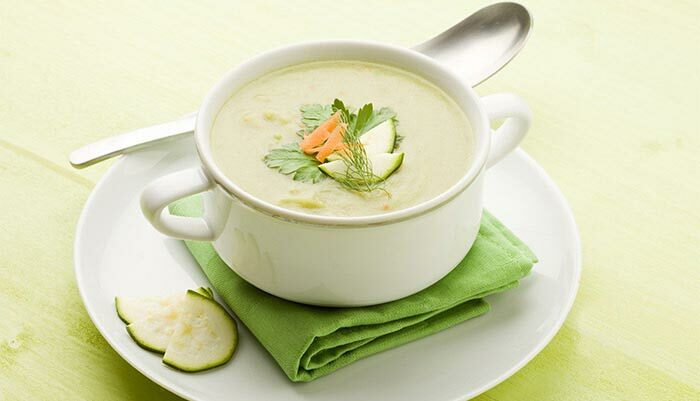 Place the boiled vegetables in a blender and blend to a smooth puree. Place the puree on medium to high flame and bring to a boil. Adjust the consistency and seasoning.